When I began this ("Houndeye") project I didn't know I'd be doing "thermoplastic vacuum forming". Learning new skills leads to other avenues of learning, exploring and creating; it never ends! I've wanted a VF setup for a long time and this was the perfect excuse to build it. This vacuum former is basically a design I found on Instructables. It's not fancy but it gets the job done, and it's cheap! A birch platen was substituted for MDF to keep the costs down. There's no need for me to go into how to build your own vacuum forming setup since "drcrash" does such a fine job. Fortunately for me it was close enough to Easter that the stores stocked plastic Easter eggs. I went all "Big-Endian" and hot-glued egg halves to a board for that multi-faceted eye look. That's not an empty frame; there is a sheet of .060" PETG stapled to it. My wife is a wonderful cook. She had the oven all pre-heated for the plastic too. First attempt: it's a little hard to see the result of the vacuum "pull" because PETG is so wonderfully transparent. Not bad for a first try, but I need to build better frames. The plastic tended to pull away from the frame as it was heated thereby producing vacuum leaks. So I'll build new frames, plug some leaks, heat the plastic just a little bit more and try to get a deeper pull. 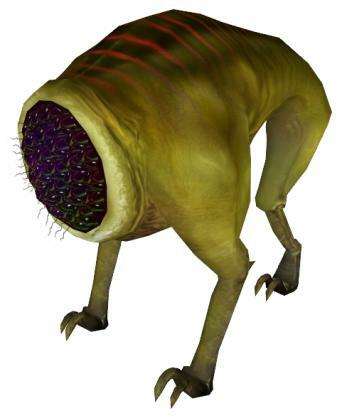 Once I have a satisfactory eye, the next steps will be painting and trimming the plastic eye piece for the Houndeye project. 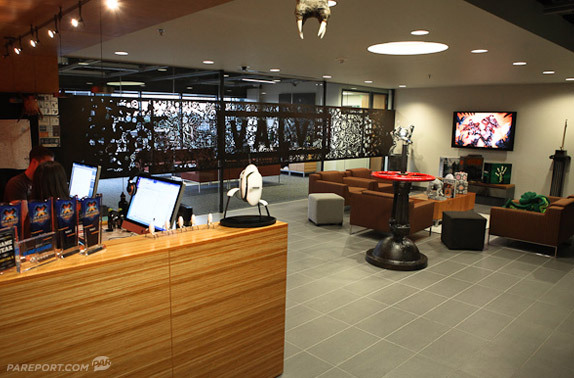 Here's a recent photo taken at Valve's HQ proving that my barnacle is still hanging out in their lobby one year later! Check out the article at Penny Arcade for a pictorial tour of Valve. Do not walk directly under the barnacle on the ceiling. The Great Nasor is completed! Here are some shots of the finished mask. Jewelry from a local thrift store adds color and excitement. Pardon me, is there something on my nose? A little face paint for flair. "I don't really like talking about my flair." Does this chain make my nose look big? 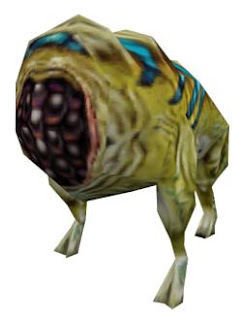 I am the great and powerful Schnoz! I believe I'll add black fabric behind the "nostrils" to hide the wearer's eyes. "Hey, baby! Wanna make out like the Eskimos do?" It's meant to be a wall-hanging but I may add some straps for tying it on. I just watched "Donnie Darko" for the first time this week. It was cool that the character "Frank" designed and made his own evil bunny Halloween mask. 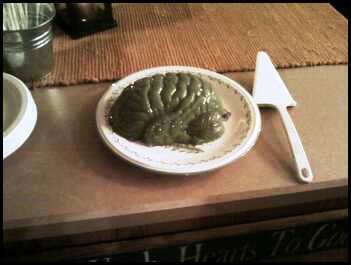 I made this brain-jello for a pot luck dinner. It was a graveyard smash, so I'm posting it here at Monster Mache.